With Boy Azooga’s share price in the ascendancy Getintothis’ Mark Flannery braved the Christmas shoppers to revel in a rising star. Walking past the revellers on their way to Christmas shenanigans at The Baltic Market, which would inevitably promise much and eventually deliver little, one hoped another more edifying festive happening would occur at District. Hosted by Harvest Sun, Cardiff’s finest, Boy Azooga and friends, returned to the city to sprinkle cheer and bonhomie. First up supporting were Chupa Cabra, a three piece from Deeside. Delivering a set consisting of short, sharp garage-punk, with a primitive drumbeat, and scattergun chords, they tore into each song with a manic intensity and a confident swagger. Spitting out lyrics such as, ” I’ve been cynical since they cut the umbilical”, they offered a world of alienation and discontent in a wry and humourous way. Summoning up the ghosts of early punk bands such as Swell Maps and Spizz Energi, Chupa Cabra certainly started off proceedings in a dynamic manner. Next on were Man Of Moon, an Edinburgh outfit, comprising Chris Bainbridge and Michael Reid. Within minutes of their set opening, Bainbridge lamented the first broken string at a gig in over 4 years. With the crowd on their side, he quickly regained his composure and the duo launched into a wall of psychedelic Krautrock drones, drums driving the beat to a minimalist sound. Songs such as This World and Sign had heads nodding in appreciation to the subtlety of the sparse sonorites and propulsive rhythms. As the venue quickly began to fill, the duo drew those newly arrived immediately to their soundscapes and finished with deep teutonic grooves, cow bells clattering to a techno beat. In sharp contrast, The Howl and The Hum gave a rather more prosaic performance. The York foursome, named after an Allen Ginsberg poem, certainly know how to deliver anthemic sounds and, for many in the crowd, they delivered what was hoped for. Songs such as Don’t Shoot The Storm and Godmanchester Chinese Bridge had feet tapping, but brimmed with earnestness and and an almost Coldplay-esque effect of hands in the air, waving lighters, or in these safer environments, torches on smartphones. 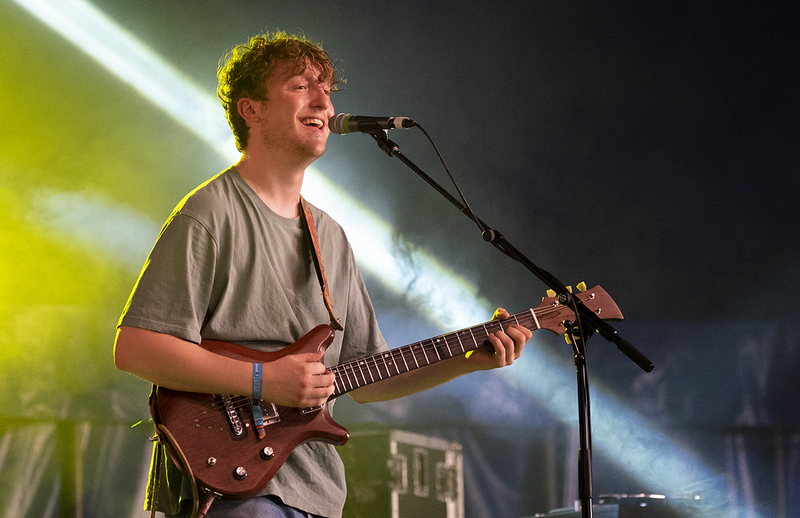 By the time headliners, Boy Azooga took to the stage, District was heaving in anticipation. With an assured air, the Cardiff band took to the stage, and opened with Taxi To Your Head. Sounding confident and tight, they have moved up a level since they last visited the city, at The Shipping Forecast in June. The unmistakable keyboard intro of Face Behind The Cigarette brought about a surge towards the stage and a mass outbreak of smiles, which didn’t let up throughout the performance. The band fed off the audience’s joy, and all four members looked like they were having the time of their lives. Their debut album, 1,2, Kung Fu provided much of the set. At one point, there was a plethora of shushes within the crowd, as Davey Newington took Jerry into a prolonged solo delight. Newington and bassist Sam Barnes were even throwing Shadows style moves as the exuberance of both band and audience met as one. With Beach Boys style harmonies and, on occasions, riffs which Black Sabbath would have been proud of, Boy Azooga held the crowd in rapt attention. With Dylan Morgan on keyboards and xylophone, and Dafydd Davies on drums, ensuring a percussive drive, the band delivered hook after joyous hook. Latest track, Do The Standing Still produced a mini mosh pit, with one lucky guy given maracas by Newington, which he gleefully shook for the rest of the night. After almost one hour of unrestrained joy, the performance ended on Loner Boogie, with it’s scorching machine gun riff, and primal beats, the crowd went nuts… “I got the loner boogie and it’s coming for you”. Boy Azooga are most certainly coming for you.